Small - $39.99 Medium - $29.99 Large - $39.99 X-Large - $49.99 Only 7 left! This is my first time purchasing from Halloween Costumes. I purchased this for an AHS-inspired burlesque routine I'm doing in February. I ordered a medium. I'm 34B-28-37. It fits with room to move, it is not "form fitting." The costume arrived sooner than the shipping time I was quoted, so that's pretty cool. The tags inside read "American Horror Story," so that's kind of cool that it's like, official, I suppose. 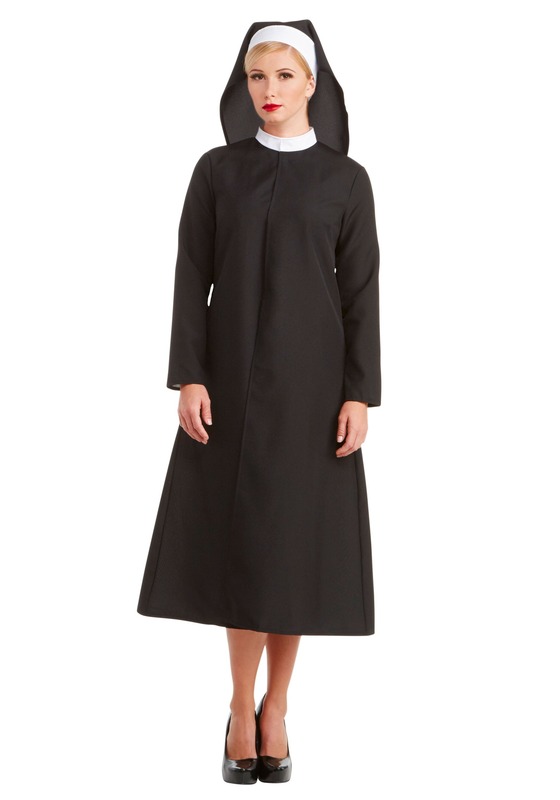 Everything is as pictured-- the front of the dress closes/opens with three velcro tabs. The red slip has adjustable spaghetti straps (which I appreciate very much!) & a side zipper to ease it on/off. The habit is one continuous white headband with the black cloth attached-- it needs to be pulled down around the neck & pushed back up to get it on. I'm only giving it 4 stars because as soon as I opened it I was like: "Oh, it's really cheap looking." I know PhotoShop & camera angles & models make costumes look better than they actually are, & I know it's a Halloween costume, but for the money I paid, I was expecting something just a bit more of a higher quality. The red slip has a tag that specifically reads: "Do not wash do not bleach do not dry clean do not iron." Ummm... what? I'm going to hand-wash it, & as far as ironing goes, it's really really wrinkled, so I'm just going to set my iron on the lowest setting & hope for the best, as not washing & not ironing are not options. I hope to order from Halloween Costumes in the future, & based on this experience I will try to keep my expectations a bit lower.